Traders also weigh another troubling drop in long-term bond yields, which many see as a warning sign of a possible recession. Large-company stocks ended broadly lower, led by drops in big technology companies. Apple fell 1.2 percent after announcing several new services including streaming video and news. Small-company stocks fared better. Trader John Santiago works on the floor of the New York Stock Exchange last week. U.S. stocks had an uneven finish Monday. The bout of volatile trading left the S&P 500 index slightly lower, extending the benchmark index’s losses from a broad market sell-off last week. The S&P 500 dropped 2.35 points, or 0.1 percent, to 2,798.36. The Dow Jones Industrial Average rose 14.51 points, or 0.1 percent, to 25,516.83. It was down as much as 130 and up as much as 100 earlier in the day. The Nasdaq composite lost 5.13 points, or 0.1 percent, to 7,637.54. The Russell 2000 index of smaller company stocks picked up 6.94 points, or 0.5 percent, to 1,512.86. 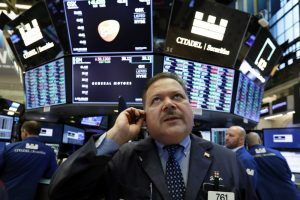 Despite the market’s recent slide, the S&P 500 index is still up more than 11 percent so far in 2019, an unusually strong start to a year. That’s in sharp contrast to the Trump administration’s predictions that growth will accelerate in the coming years. Still, the economists say they think a recession remains unlikely any time soon. Worried investors have shifted money into bonds, sending yields lower. The yield on the 10-year Treasury slid to 2.40 percent from 2.45 percent late Friday. At one point, the yield had fallen to 2.38 percent, briefly triggering deeper declines in the stock indexes. The market’s recent skid follows what has been a strong start to the year on Wall Street as stocks rebounded from a steep slide at the end of 2018. The bull market for U.S. stocks recently marked its 10th anniversary and is now the longest of all time. Monday’s shaky start to the came amid a lull in news on the tariffs war between the United States and China. Trade talks are due to resume Thursday in Beijing. U.S. stock indexes did not appear to have a significant move either way in response to news that the special counsel’s probe into Russian meddling in the 2016 presidential election concluded without finding evidence that the Trump campaign conspired or coordinated with Russia. Attorney General William Barr issued a summary of the report Sunday, in which Special Counsel Robert Mueller did not find evidence that President Trump’s campaign conspired or coordinated with Russia to influence the election. Mueller also reached no conclusion on whether Trump obstructed justice. Chipmaker Micron Technology dropped 2.6 percent, while Synchrony Financial slid 1.4 percent. Homebuilder Lennar climbed 3.6 percent to lead the consumer discretionary sector, while retailer L Brands picked up 2.6 percent. Apple’s splashy announcement of new offerings, including a subscription TV service due to launch in the fall, failed to impress investors. The stock slid 1.2 percent after the consumer electronics giant disclosed details of its forthcoming Apple TV Plus and other services, including subscriptions for games and news. The new service will put Apple in direct competition with big streaming services including Netflix and Amazon Video. Apple is pushing digital subscriptions as it searches for new growth amid declining sales of its iPhones, long the company’s marquee product and main money maker. Airline shares declined as major carriers continued to cancel flights due to the grounding of Boeing 737 Max aircraft as federal regulators continue to investigate two deadly crashes involving the plane model. American Airlines fell 1.2 percent a day after the company said it will be canceling about 90 flights a day through April 24. The airline has 24 Boeing 737 Max aircraft in its fleet. Southwest Airlines, which has 34 Max aircraft, is canceling, on average, 130 daily flights. Its shares slid 1.3 percent. Boeing fared better, adding 2.3 percent. Energy futures finished mostly higher. Benchmark U.S. crude oil dipped 0.4 percent to settle at $58.82 a barrel. Brent crude, the international standard, rose 0.3 percent to close at $67.21 a barrel. Wholesale gasoline added 0.6 percent to $1.94 a gallon, heating oil gained 0.7 percent to $1.98 a gallon and natural gas inched up 0.1 percent to $2.76 per 1,000 cubic feet. Gold gained 0.8 percent to $1,322.60 an ounce, silver rose 1 percent to $15.57 an ounce and copper picked up 0.5 percent to $2.86 a pound.